Two Sunday's ago was an absolutely gorgeous day. After not being on the bike for almost a week due to traveling and inclement weather, the day was shaping up to be an amazingly gorgeous day for a bike ride. With the forecast calling for temperatures in the low 70's and cloudless skies, my Specialized road bike begged to be ridden long and hard. Yet despite the amazing weather and the incessant begging of my Specialized, I donned not Lycra. 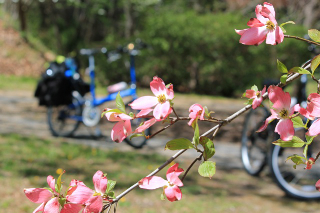 Instead, I put a couple panniers on my Bike Friday, loaded them with picnic supplies and a camera. Then my wife and I spent the better part of the day riding around the Yorktown Battlefields. This past Christmas, I had bought her a new SLR camera and we spent this gorgeous Sunday learning how to use it. ...but at least it is still in the picture! !